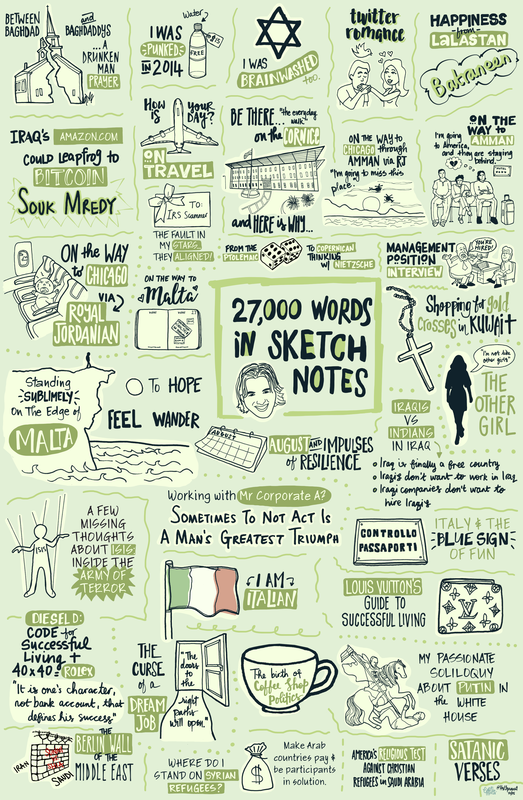 The sketchnotes is a snapchat of 33 blogs in 27,000 words that captures some of my life experience in 2015. I am a child of the Cold War. I was born in 1961, the year the Berlin Wall was built. I was a child during the Vietnam War in our fight against the domino effect of international communism. I graduated from high school in 1979 when the Soviets invaded Afghanistan and was 27 years old, in 1989, when the Berlin Wall fell. The communists were evil because they practiced mind control. It wasn’t just political control, it was thought control. Anything you said or did could be used against you if it was perceived by the protectors of the public as a threat to the people. Neighbors were encouraged to inform on neighbors. If someone knew of that a friend harbored “dissident” thoughts, they were required to report this to the authorities. If they did not inform on their friends, they were at risk of losing their job just as much as their friend was for saying something “against the people,” which was newspeak for against the government. It was “extremist.” Soviet “citizens” where sent to re-education camps were they were treated for mental illness (anything against the people — which meant against the government because they were the vanguard and protector of the people — was illegal, subversive, and clearly as sign of mental illness that required re-education). And so we come to America in 2016 where the US Government Policy is “see something, say something,” which though ostensibly is to be used against Islamist terrorism in practice cannot be used agains Moslems for fear of being “prejudiced.” Witness the San Bernadino mass shooting where lots of people saw something but refused to report not for any fundamental concern for a free society, but out of fear that they would be called Islamophobic or bigoted against middle-eastern men. But Americans are now being de-sensitized the idea of reporting to the “authorities” on the thoughts and actions of Americans. From the TSA — which created defacto internal travel control like the Soviet Union practiced — to the “see something say something” slogan stamped into our brains by government propaganda (propaganda is not inherently bad, mind you) to required reporting of “offensive speech” to government authorities in government employment and the normalization of tracking (via RFID chips on school IDs) and some may start to wonder if we have become them. Now the President of the United States wishes to use accusations of “mental illness” as a reason to seize guns from citizens. I argued (not fought — I’ve never served in the armed forces) against communism in all its forms from the time I was a teenager. Only to find, today, that I’ve lost the fight, not overseas, but in my out native land. Communism — totalitarianism — is seeping and creeping and overwhelming this country. That our current President — nay, our current Congress — could pass a bill that would require doctors and the Social Security administration to report to the “authorities” “mental illnesses” that would then result in the confiscation of firearms is a fundamental betrayal of privacy, liberty and the idea of limited government. This country — the United States of America — was founded on the idea of a limited central government. We have willingly cast this pearl aside in the false hope of general security. Mental illness in the Soviet Union meant dissident thoughts — thoughts not approved by the communist party. For example, criticizing the government for having “reeducation centers” which where justified as defending the rights of Man, was sufficient cause to send one to a Gulag, a concentration camp, AKA re-education center. That’s what happened to Alexander Solzhenitsyn, a Russian military officer, a Russian patriot, and one of the greatest heroes of the Cold War. He loved Russia, but had the courage (and paid the price) for criticizing the Soviet government. He was an extremist to the Soviets and was send to a “re-education” camp because dissent thoughts were considered a form of mental illness. Am I saying that doctors and neighbors and government officials can label someone as “mentally ill” and have be stripped of their Second Amendment right to keep and bears arms? Yes — our government is moving in that direction. Anyone in America that believes in limited constitutional government, or the right to keep and bear arms, has an “extremist” idea in the minds of this President, his supporters, that vast majority of college professors (our religious leaders) and most of the press. If you don’t think this is where things are going you are naive. That which I argued against regarding the Soviet Union is happening now in my own country — suppression a religious freedom, suppression a freedom of speech, suppression of political organizations, the “newspeak” which re-defines political differences as “extremist,” un-restrained intervention in the internal affairs of foreign countries in the name of giving them “human rights” (just like the Soviets tried to do). Anything against the agenda of a the intellectual and political elite is denounced as racist, homophobic, Islamophobic, misogynist, or sexist. This is like calling Solzenitysn a capitalist pig — the words are used the same way — terms that warned others not to associate with people or their ideas for fear of persecution by the government. So there you have it. We have become them. Welcome to 1984 and Newspeak. Welcome to the age of repressing citizens by calling them mentally ill for engaging in thought crime. It is too late to stop this — we are already there. And like with the Soviet Union, only an economic collapse will wake us up from our willful ignorance of free thought, liberty, and a familiarity with the Almighty without which man cannot conceive of a god other than the oppressive boot of the state.